As mindfulness is something that I regularly reference in some shape or form in my posts related to my kids- without getting too wordy, I wanted to share this with you. Julien is among a great group of kids here in our happy beachy community of families who love where we live and value a quality of life that offers not only the beach as our great big backyard but a fabulous tropical urban, walking environment with fabulous amenities and likeminded folks. We also seem to share a desire to give our children life experiences and values that will grow them into mindful, considerate global citizens. I showed him the cover of the New York Times last weekend and asked him to read the headlines and to think about how those people must be feeling. I asked him to go to school that day and think about possibly helping out (or not). Initially, he threw me $2 cash he had earned the week prior for doing chores- but I told him to wait- and think about it. My approach meant not to pressure, but rather to incite a sense of empathy which in turn, helps foster mindfulness. I try to do this daily whenever I deal with my kids. Obviously, this isn’t always so easy with two boys screaming over Minecraft- but it really is one of my deep rooted and important, parent principles. Julien came home from school that day and said that he wanted to give all of his money and that he still wanted a Pokemon card binder. You can’t win them all- but at least my lessons I feel, are making some baby steps toward childhood enlightenment! 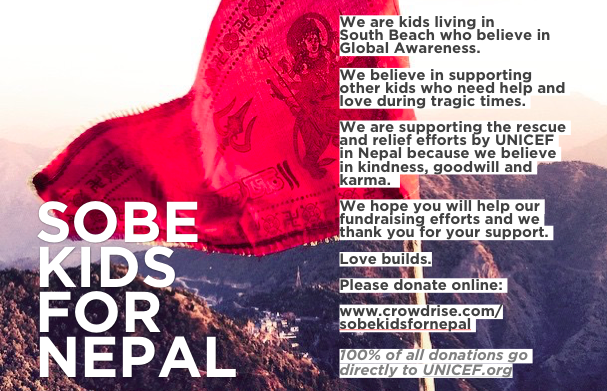 On that note- we started a Crowdrise fund called SOBE KIDS FOR NEPAL. Your donation goes directly to UNICEF. Donate there or donate directly to UNICEF as you so wish. I’m just here to facilitate the transaction and spread the word. Every child is our child.